Mon Mothma, a native of Chandrila, was a female Human who served an important political figure from the waning days of the Galactic Republic, one of the founders of the Alliance to Restore the Republic, and the first Chief of State of the New Republic. When the foundation of the Galactic Empire replaced the Republic that had existed for many millennia, she met with her allies in the Senate, such as Senators Padmé Amidala and Bail Prestor Organa. In 2 BBY, she signed the Corellian Treaty, along with Organa, Garm Bel Iblis, Rahm Kota, and Galen Marek, in order to form the Alliance to Restore the Republic. 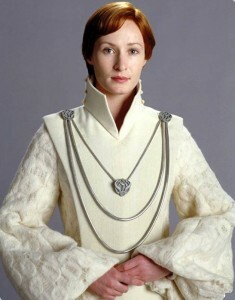 She, along with the others, were taken captive aboard the Death Star I, although they were rescued. She played an important role in the ensuing Galactic Civil War, and after the decisive Rebel victory at the Battle of Endor, she became the first Chief of State of the newly founded New Republic. She also had a daughter, Lieda, and a son, Jobin. In 24 ABY, she passed away peacefully on Chandrila. 1. White or winter white floor-length A-line gown of a fleecy fabric or a medium-weight fabric with a circular pattern. The sleeves are bell-shaped and gathered to a tight cuff at the wrist. 2. White or winter white floor-length contoured tabard of a heavy-weight wool-like fabric with a V-neck and a very tall notched collar with a set of three ball-shaped cream buttons on each side. 3. White or winter white tailored flats or pumps. 4. Two silver Hana pendant brooches, one at each shoulder with two thick silver cords draped between them and a silver Hana pendant on a thin silver cord.